The identity of another one of the five officers killed in the Dallas sniper attacks has come out. Patrick Zamarripa, a member of the Dallas Police Department was identified by family on Twitter. His death has not been confirmed by the DPD, but his stepbrother Dylan Martinez posted comments to the social media site calling Zamarripa a "family man and military veteran," adding that his death is "just not right." Dallas Police Chief David Brown said that four gunmen attacked police at the Black Lives Matter protest Thursday night. The protest, peaceful until shots rang out, was in response to the recent deaths of Philando Castile and Alton Sterling. 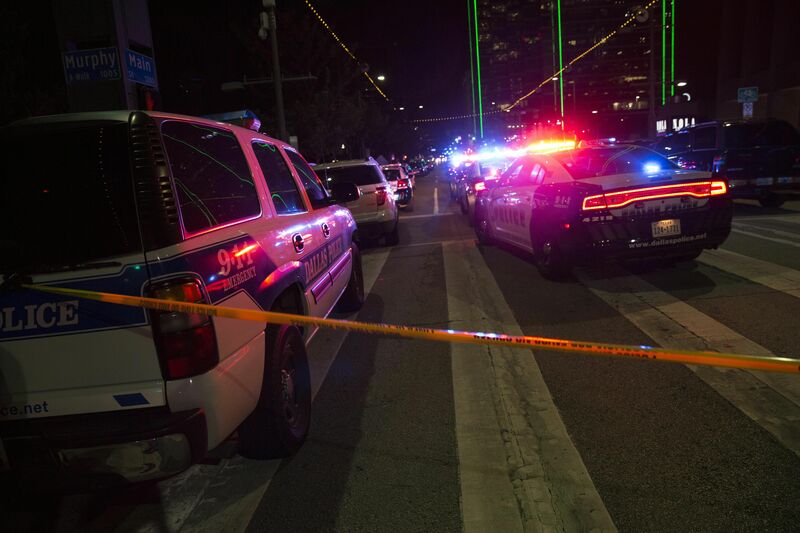 Also killed was one Dallas Area Rapid Transit officer, Brett Thompson. In total five officers were killed; the other three are believed to be with the DPD. Seven more police were injured in the attack, as were two civilians. Another of Zamarripa's other step-siblings, Dustin, posted on Twitter before the news was released. "Keep my stepbrother in your prayers. He's a Dallas cop and was at the rally. Parkland hospital called my parents to go to the hospital," he sent out to his followers. He followed later with a picture of Zamarripa, adding, "Love you brother. Couldn't be prouder. We'll see you again," with the hashtag #PrayForDallas. Zamarripa was active on Twitter. His bio reads: "Addicted to the thrill of this job. I own the night. I love my Country, Texas, Family, God, Friends, and Sports! Don't Tread on Me! 'Merica." Several of his posts include pictures of his young family and work on the force. He shared a few snapshots from his work at the Trump rally in June on the Dallas Police Department Response Team. He ate some Jimmy John's to prepare for the long day. Another fun moment on the job was taking a selfie with Cuba Gooding, Jr., who was visiting Dallas. He was also involved with the Dallas Police Association, the union that represents Dallas officers. And he and his partner had fun outside of the job too, this time at a Cowboy's game. Last September, he tweeted a photo on the job protecting the Dallas Pride celebrations. In June, he tweeted excitement after the Supreme Court's marriage equality decision. He tweeted in solidarity when two New York officers were killed in the line of duty in December 2014. The majority of the other tweets are from his day-to-day life: pictures of tasty dinners out, coffee surprises from his significant other, and videos of his golf swing. A large number are photos of his young daughter — some in Cowboy gear. His posts, more than anything, are filled with a zest for life and enjoyment of his job, protecting the people of Dallas.